Shocking figures and statistics — like sea levels rising faster than previously thought and rivers drying up in a matter of days — are reported terrifyingly frequently: therefore, keeping climate change in the public eye, maintaining debate concerning it, and informing people of its cost despite the White House’s stance is vital. 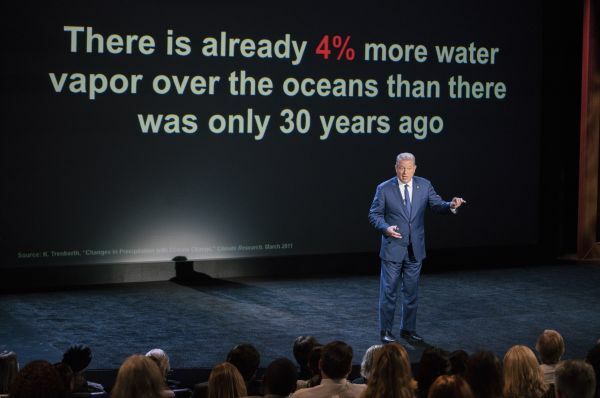 Al Gore giving his updated presentation in Houston, TX in An Inconvenient Sequel: Truth to Power from Paramount Pictures and Participant Media. Removing the United States from the Paris Agreement is a reckless and indefensible action. It undermines America’s standing in the world and threatens to damage humanity’s ability to solve the climate crisis in time. But make no mistake: if President Trump won’t lead, the American people will. Civic leaders, mayors, governors, CEOs, investors, and the majority of the business community will take up this challenge. We are in the middle of a clean energy revolution that no single person or group can stop. President Trump’s decision is profoundly in conflict with what the majority of Americans want from our president; but no matter what he does, we will ensure that our inevitable transition to a clean energy economy continues. Indeed, several promising avenues of change have opened in recent months, including prices of renewable energy sources falling rapidly, the world’s largest floating solar plant coming online, and renewable energy sources breaking records frequently. If we want to seriously combat climate change, collective information is as important as collective action — films like Gore’s are vital if we are to teach as many people as possible about climate change, as they provide a counter discourse to the misinformation being propagated by Trump.